I developed this recipe for EcoSalon as a way to use daikon radish. It's abundant in the markets right now, sweet, crisp, and super healthy. My body craves it lately which tells me it's doing something good for me, though I'm not sure what exactly. I wanted a rice noodle dish that tasted like a báhn mi, but without the meat and bread. I know that doesn't really make sense. It's just a flavor dream I had. This recipe will make more pickle than you need with the noodles. It will keep for weeks in the refrigerator in its liquid. Wait until you see the jar I'm storing mine in. Peel the daikon and cut it into 2 or 3 inch long sections. Half the sections lengthwise and, with the cut side down, slice each section into thin slices. Stack the slices and cut them into matchsticks. Peel the carrot and cut it the same way. Place the carrot and daikon in a colander and add the salt. Toss with your hands, massaging the vegetables until they start to soften and release liquid. Let them sit in the colander for about 30 minutes to drain. 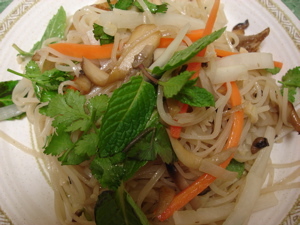 Meanwhile place the rice noodles in a bowl and soak them in warm water to cover for 30 minutes. Rinse the daikon and carrot, drain and squeeze excess liquid out with your hands. Drain them on a clean dish towel or paper towel and put them in a clean bowl. In a small bowl, whisk together the, rice vinegar, fish sauce, sugar, water, and chili sauce. Pour the mixture over the vegetables and let them sit for 15 minutes or up to several days, refrigerated. (this step can be done ahead). In a wok or large sauté pan, over high heat, warm the oil. Add the mushrooms and a pinch of salt and let them cook without stirring until they begin to sizzle and brown. Stir them once and let them brown a bit more. Add the garlic and cook, stirring, for 1 to 2 minutes, without letting the garlic burn (you may need to turn down the heat). Add the rice wine or sherry and the fish sauce, stir once or twice and then quickly add the drained noodles. Toss the noodles, mushrooms, and garlic with the liquid from the fish sauce and rice wine until the noodles are soft and chewy. Turn off the heat and add the desired amount of pickled vegetables and a generous amount of cilantro and mint, reserving some for garnish. Transfer to plates and garnish with more herbs. 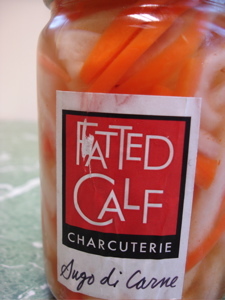 Pack the leftover pickled daikon and carrot in a jar with the liquid and refrigerate.